I would like to quickly move four of my brushes, that are simply AWESOME, but I do not use them often enough. 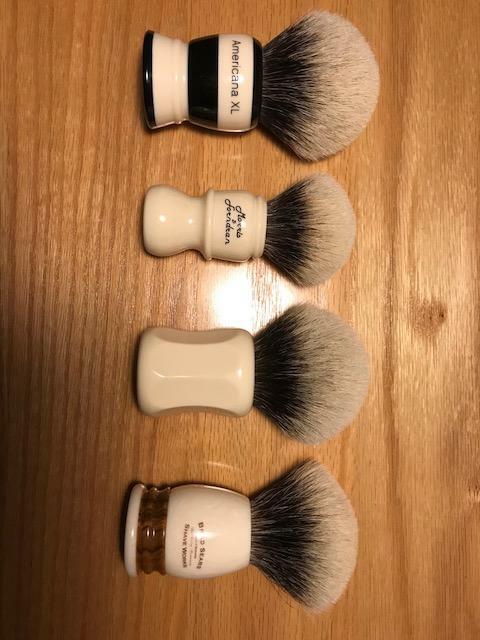 I purchased the 32mm Shavemac, 32mm Thater and 26mm L7 from good members from a different forum with only a couple of lathers on them. I used the L7 a dozen times, and only three times each the Shavemac and Thater. I purchased the 30mm Preacher directly from Brad and used it maximum 10 times. All brushes will be cleaned and combed before shipping in their original boxes. They all cost over $200 each and in order to move them quickly I am offering deep discounts. Please send me PM if interested. Great brush offerings and a great member to trade with!